It’s that time of year when we are getting out of bulky clothing and warm boots, wiggling our toes in relief and looking for light and comfortable footwear. I rejoice at every chance to go barefoot outside. Feeling the soft earth and silky grass under my feet is divine. However, living in a city, the reality is that for any trip further than to a nearby park, some sort of footwear is a necessity. For a few years now, I do not wear heels, aside from dressy occasions. Heels perch one at an angle to the ground, putting the entire body in a state of constant compensation to keep itself upright. Wearing heels shortens the calf muscles and plays havoc with your back, all the way up to your shoulders, neck, and head. Add to it frequent bouts of sitting that comprise our day, and the impact of heels is amplified. If you want to get the details on how heels change the loads on your body, I highly recommend Katy Bowman’s Every Woman’s Guide to Foot Pain Relief: The New Science of Healthy Feet. It’s a most enlightening read on proper body alignment, gait, and how our footwear affects everything in our musculoskeletal system. The problem is that most footwear on the market (including children’s footwear, which is alarming) has a positive heel. Any heel will alter the way your body is aligned, even an inch makes a difference, and the shorter the body, the more impact the same size of a heel has. Most running shoes have a heel too. It is a challenge to find flat-soled shoes in mainstream outlets, but they do exist. Katy Bowman has a great list of minimal summer footwear on her blog, Nutritious Movement: Shoes, the Summer list, and another talking about flat-soled solutions for children: Your child might be wearing heels, right now. I’ve ditched my heels over 5 years ago now and it has made a huge difference. I’ve always walked barefoot at home and whenever I had an opportunity to be on a beach, in a park, or anywhere without concrete littered with broken glass and other debree. Now when I do have to wear shoes, I opt for Vibrams. My favourite is the Alitza model – an elegant, yet minimal design. I also own the Classic Vibrams which are basically five-finger slippers. I find them comfortable, although for me nothing beats the comfort of bare feet. Take a look at the heels in your shoes. Have they been distorting your body position for years now? Could they be exacerbating stiffness, discomfort, or pain in your body? If so, I would suggest trying to lower your heels to the ground. It’s not necessary to get expensive footwear right away. Check out a second-hand store and see if you can find a pair of cheap, truly flat shoes to try out. You can also make your own minimal shoes (see Shoes, the Summer list). Keep in mind that if you’ve been wearing heels for a long time, it might be hard to go directly to flat sole. Give yourself a time to transition, lower your heels gradually. Check whether your feet are being overly squeezed by a narrow toe box (most people’s are). Look at shoes that allow your toes to spread comfortably. The more you squeeze your toes, the more the other parts of your foot have to compensate for the load that is normally distributed through your toes. That’s how bunions often form, and the only solution mainstream medicine has been able to offer is repeated surgery. Flip-flops are not great either, since they make your toes have to grip in order to keep the shoe on, once again making the rest of the body compensate for it. You can modify a flip-flow, however, to add an ankle strap that will hold the shoe on your foot without the need for the toe-gripping action. This summer, try going barefoot, even if only on grass or sand. 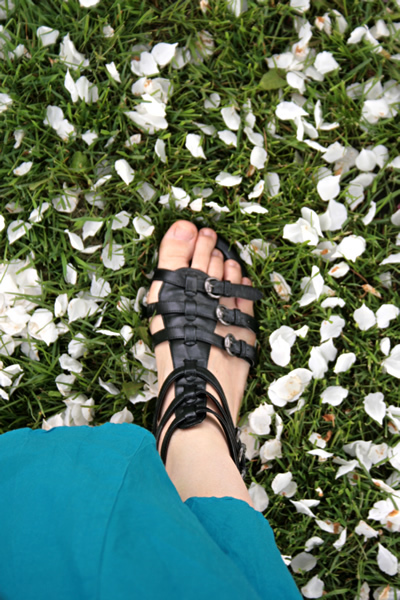 Take your shoes of at a park, a beach, or in your garden. There are many tiny bones and muscles in our feet, they get stiff stuck inside shoes for long periods of time. Let them stretch. Try picking up a stick or a pebble with your toes. Children’s playgrounds often have a variety of surfaces – sand, grass, cedar mulch, bare ground, pebbles. Instead of sitting on a bench while your children play, test the ground with your bare feet and let your feet explore a variety of textures. Where would you go barefoot? What are your choices for healthy, comfortable shoes?